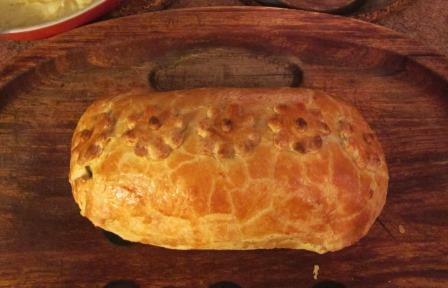 Last week, for a dinner party to celebrate two recent birthdays, Tom’s and our friend Betty’s, I made a Beef Wellington. I couldn’t even remember when I’d last made one, but Tom, who had a hunger for a big piece of first-rate beef, had requested it and I was happy to indulge him. 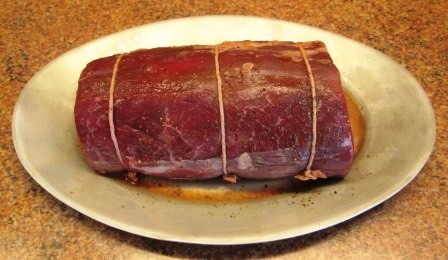 This pastry-wrapped beef fillet roast is a delicious and impressive dish in the high old classic style that I love, and really not all that difficult to make. 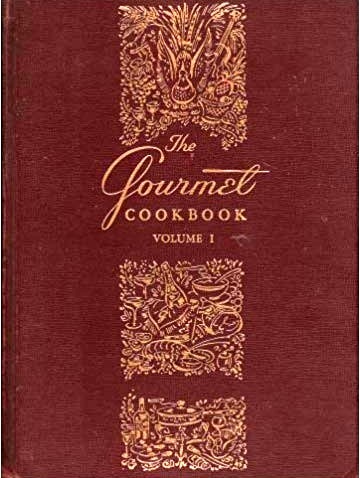 The recipe I’ve always used is one I copied out from someone else’s Gourmet Magazine cookbook – the original version from the 1950s. Over the years I’ve made a few alterations of my own, trying different kinds of pastry crust, omitting bacon slices for the initial roasting, and replacing the recipe’s blithe demand for “3 or 4 truffles” with a layer of mushroom duxelles. The pastry recipe I like at present, a pâte brisée from Simca’s Cuisine by Simone Beck, uses a whole egg and half a cup of white wine instead of water. 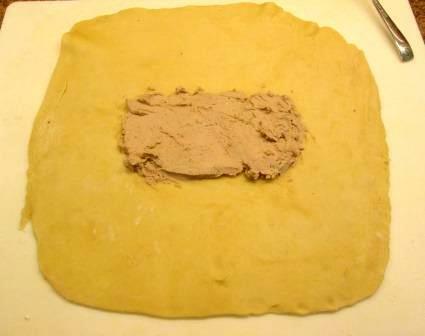 It produces a lot of a nicely savory crust, the excess of which can be frozen for future use. I made up a batch a day in advance. Early the next day I rubbed my two-pound chateaubriand, cut from the thick end of the fillet, with cognac, salt, and pepper. It looked good enough to eat just as it was! 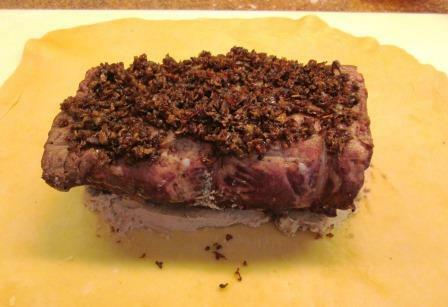 It went into a 425° oven for just 15 minutes and then I set it aside to cool while I made the duxelles. 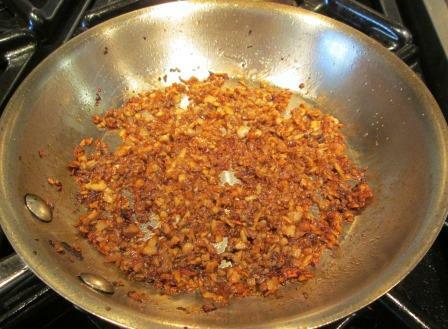 I finely chopped a quarter-pound of mushrooms, ferociously twisted small handfuls of them in a cloth to squeeze out their water, and sautéed them in butter and oil along with a little minced shallot. Some recipes say you don’t have to do the squeezing – the liquid will evaporate if you cook the mushrooms long enough. OK, but I think the results are better with the shorter sauté. Also, the squeezing is kind of fun – it’s amazing how much water comes out of apparently dry mushrooms. I set the meat on the mousse and spread the duxelles over the top. 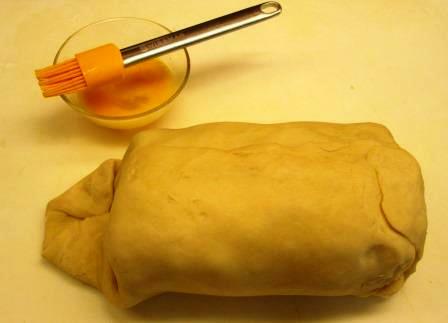 I wrapped the dough snugly around the meat and its accompaniments, trimmed off the excess, and sealed the seams with beaten egg. I turned the loaf seam-side-down and moved it to a baking sheet, where I gave the whole thing a brushing with the egg. 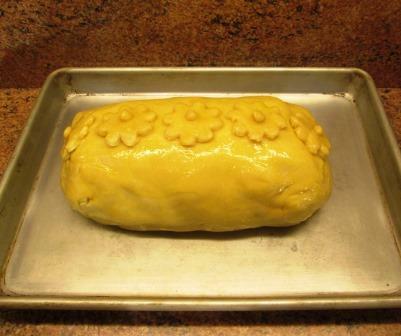 Then for fun, I cut flower shapes from the leftover dough, lined them up along the loaf, and brushed them with egg too. 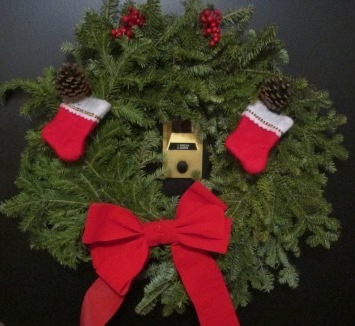 They were a little silly looking, but they gave it a festive air. By then it was still only mid-afternoon, so I refrigerated the pastry until evening. The recipe called for baking it 30 minutes at 425°, but since mine had been cold, it took a little longer. It came out looking very cute, sort of like a cross between a loaf of country bread and a child’s decorated football, with an aroma that carried a promise of great things. And it delivered on the promise. 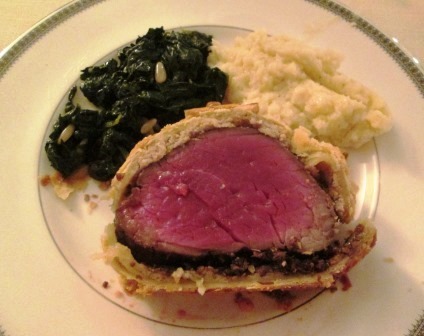 When sliced into, the pastry crumbled a bit, but the beef was rare to perfection – absolutely gorgeous. It simply melted in the mouth, moist with beef sweetness, and the accompanying flavors of mousse and duxelles enhanced every bite of the savory crust they’d annealed to. Duchesse potatoes and sauteed spinach – the latter dotted with pignoli and raisins – played excellent supporting roles on the plates. This was a properly festive dish for the two birthday people, and it matched beautifully with the 1982 Chateau Montrose St. Estèphe that Beloved Spouse had chosen to pair with it. Need I say we all thoroughly enjoyed the celebratory meal? In the later twentieth-century culinary world, Patience Gray was the epitome of the eccentric Englishwoman. 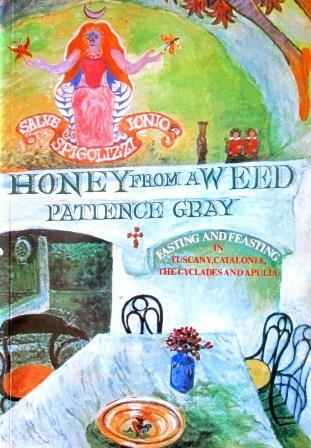 Her adventurous and impoverished years of living in remote parts of the Mediterranean region are memorably captured in her cookbook Honey From a Weed: Fasting and Feasting in Tuscany, Catalonia, the Cyclades and Apulia – which I acquired only recently. It’s a fascinating book, though to me really more for reading than for cooking from. It’s filled with history, admonitions, anecdotes and folklore about seemingly every vegetable, every herb, every land and sea creature Ms. Gray ever encountered in her many primitive dwelling places. The first dish I’ve tried from the book is called Guinea Fowl My Way. 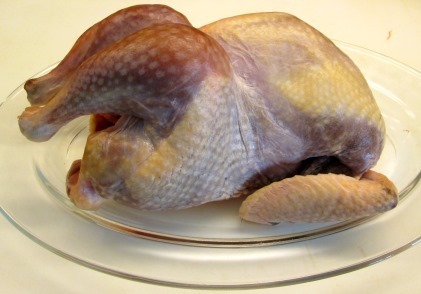 Now, I like guinea hens: they’re leaner than chickens, with darker, denser flesh, richly flavored and just a bit gamy. But this recipe had an additional attraction for me because of this remark in her headnote: “I propose the following anarchic method; carry it out before protesting.” I couldn’t resist the challenge! So, off to the butcher shop for a bird. 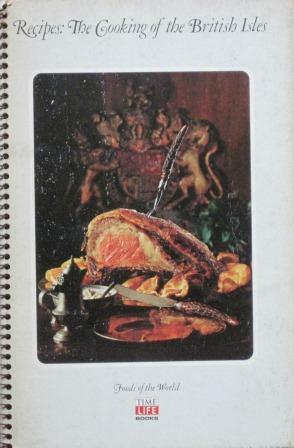 I had to order it, and the one I received was over three pounds, half again as big as the recipe called for. 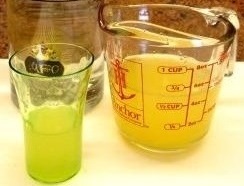 The anarchic character of the recipe showed at the start: The first thing I had to do was make a grog. 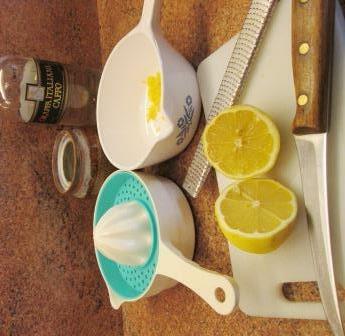 This involved boiling up lemon juice, lemon zest, sugar, black pepper, and water, then stirring in a hefty dose of grappa. Gray goes on: “if you are anticipating a cold – I am writing this in winter – drink some of it hot. Leave what remains to infuse.” I did. 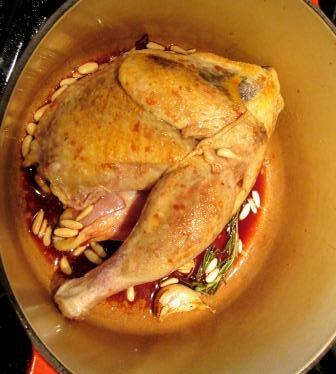 Next was to brown the guinea hen in olive oil in a frying pan with garlic cloves. 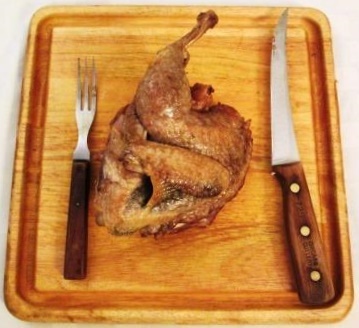 Since I’d be making the dish just for two, I cut my bird in half and froze one half for another time. The shape of the half hen made it reluctant to brown very well, but I did what I could, then transferred it to a casserole in which it fit snugly. Since it had no body cavity to hold a required rosemary sprig, pine nuts, and more garlic, I just added them to the pot. 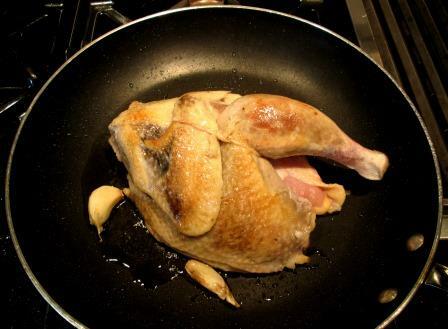 Then I deglazed the frying pan with red wine and poured that over the bird. My half bird took about an hour to cook, longer than the recipe said for a whole bird, probably because mine was older and with firmer flesh. A few bastings with the pan juices kept it moist, and it came out looking quite nice, if you allow for a guinea hen’s rather splotchy-looking skin. It all made a good meal, though not noticeably anarchic. The guinea hen was very flavorful, the light gravy excellent on both the meat and the noodles. Its alcohol had all cooked away, of course. I don’t know that I’d go the whole grog route again if I make the dish another time, but a slow braise like this is clearly a good way to handle guinea hen. I’ve done posts on making Christmas cookies ever since I started writing this blog. Most have been about various favorite recipes that I’ve made for many years. Since I try to write about dishes that will interest my readers, I know I shouldn’t feature the same cookies every year, no matter how beloved they are. (In that respect, writing about food is different from making it.) So this year’s cookie post is about two kinds I’ve never made before, along with a to-me-irresistible celebration of two of the kinds without which it wouldn’t be Christmas at our house. The age of the recipe is evident from the absence of any kitchen machines in its instructions – which I tried to follow as written. So I rubbed the butter into the flour by hand, then stirred in sugar and the minced candied peel. Next, I was to “bind the mixture with beaten egg to form a cohesive dough” using a knife. Odd as that sounded, I tried it, but a knife is really not the tool for that job. Surely there were spoons in those days! I reverted to completing the dough by hand. The rolling, cutting, and baking were the standard procedures, and the cookies came out quite well. Firm and crunchy, with a little chewiness and pleasant flavor from the orange peel, they have a certain charm as an old-fashioned holiday treat. They’ll also be very nice, I think, alongside a not-too-sweet dessert wine. 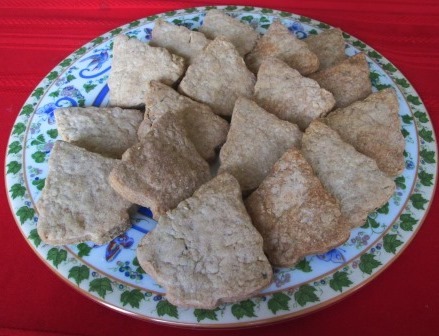 I found this recipe for a sort of modern variation on spice cookies in Lee Bailey’s Country Desserts. It’s attributed to the pastry chef of the ultra-fashionable, now long-closed Barefoot Contessa food shop in ultra-fashionable East Hampton. Despite the glamorous pedigree, it’s a good, sturdy cookie. 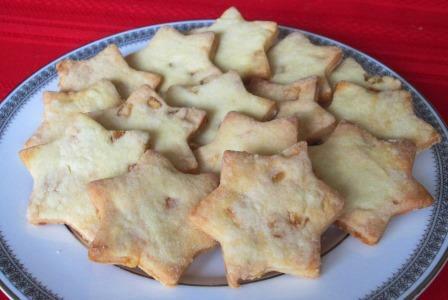 To sablés’ basic shortbread mix of butter, sugar, and flour, the recipe adds ground almonds, cinnamon, nutmeg, allspice, and Grand Marnier. These, and the use of brown sugar rather than white, struck me as intriguing flavors for a cookie. I almost got in trouble over my long-kept brown sugar, which had solidified in the annoying way it does, and had to be pulverized. Unlike fresh brown sugar, it had no moisture, and I didn’t take that into account in mixing my dough. Accordingly, it was very dry and refused to hold together, even after overnight refrigeration. The next day I realized the cause of the problem and was able to correct the texture by kneading some water into the dough. That held it together for rolling out and cutting in Christmas tree shapes. The cookies are very good. The texture isn’t as “sandy” as sablés typically are, but just a little rough in the way shortbread is. The flavor is unusual, subtle, and interesting. Though very plain looking, they’re rich and satisfying, and will make a nice addition to my Christmas repertory..
Is there anything more quintessentially American than peanut butter cookies at Christmas time? I’ve made them every year-end holiday season for as long as I can remember, and my mother made them all through my childhood. This batch came out exceptionally well, a little crisper and more tender than some in past years. I feel awfully sorry for people with peanut allergies, who can’t enjoy these little delights. Cream cheese in the dough for these tiny rolls makes for a smooth, soft pastry, which happily encloses fruit and nut fillings. I make them as my mother did, way back in my childhood. This year I did half the batch with walnuts, hazelnuts, cinnamon, and sugar, the other half with the two nuts and strawberry jam. They’re festive flavors, and both kinds came out very well. It may be a bit of a struggle to keep Beloved Spouse from eating them all before Christmas gets here. 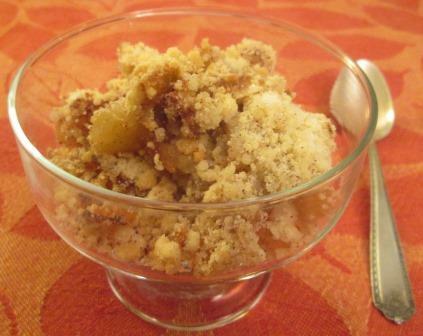 Apple Crumble is not a dessert that has ever been in my repertoire. If I thought about it at all, I’d probably have assumed it was something one would learn in a Girl Scout troop’s cooking class. 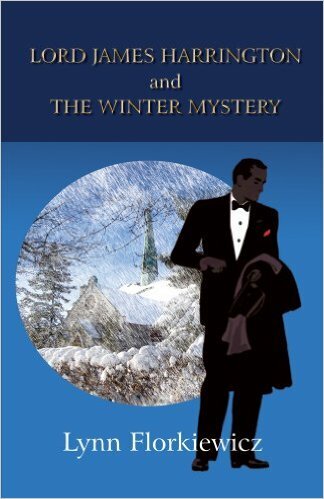 But I recently came across a recipe for it in a novel I was reading on my Kindle called Lord James Harrington and the Winter Mystery. I didn’t really like the book: It’s one of the “cosy” variety, and I found the writing pedestrian and several of the characters ridiculous. A lot of eating and drinking goes on in it, which I generally approve of, but with far too many sweets being served and glasses of cream sherry taken as aperitifs. 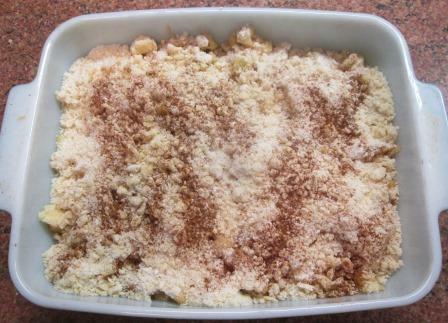 When, however, Lord James makes his grandmother’s famous apple crumble for a village fête, I was mildly interested, and when I found the recipe printed at the end of the book, I decided to try it. I’m glad I did: It’s a nice little dessert. I almost said “easy as pie,” but it’s actually much easier than pie. I’ve now made it a few times, always successfully. Here’s what it takes for two to four servings. 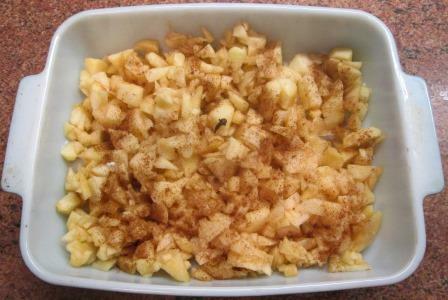 You peel, core, and chop up two apples, put them in an unbuttered baking dish, and top it with two tablespoons of sugar, one clove, and a sprinkling of cinnamon. Rub together three ounces of flour and three tablespoons of butter to make crumbs; stir in two more tablespoons of sugar; spread that mixture over the apples, and sprinkle on more cinnamon. Bake at 400° for 40 minutes. Serve warm or at room temperature. I rate this apple crumble highly on the pleasure-produced to work-involved ratio. With minimal ingredients it produces classic apple dessert flavors. You can use any kind of apple, throw the ingredients together, let the dish sit until needed, bake it in advance and reheat it later. Once cooked, it even keeps well in the refrigerator for a day or two. Leftovers make a nice breakfast. This is as close as one gets to a culinary no-brainer. Cooking chicken and leeks together in a dish makes both taste better than they do on their own. Evidently, it’s a real synergy: The combination creates umami, that mysterious fifth taste discernable to human palates. The chemistry of it seems complicated (ribonucleotides and glutamates) but the effect is simply to make certain ingredient pairings produce unexpected flavor. That was definitely the case with the Cockaleekie I made this week. The recipe I used – from the Cooking of the British Isles volume of the Time-Life Foods of the World series – is just about the barest version there is of this old Scots soup. 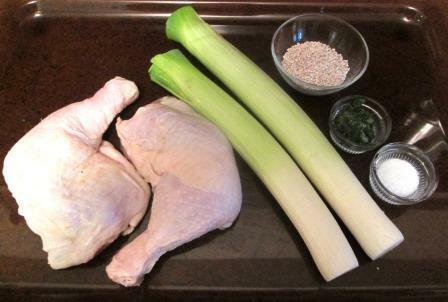 Just six components: chicken, leeks, barley, salt, parsley, and water. The full recipe (I was making half) called for a stewing fowl. What I had were very large chicken legs from my favorite poultry farm out on Long Island, and I knew such well-grown birds would yield plenty of developed flavor. 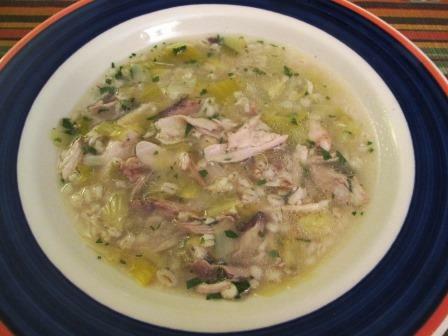 I dropped the legs into a pot of cold water, brought it to a boil, and skimmed briefly; added the cut-up leeks, barley, and salt; and simmered until the chicken legs were almost ready to fall apart – about an hour and a half. On the face of it, this seemed to be the essence of all the old jokes about British cooking: Whatever it is, boil it to death. 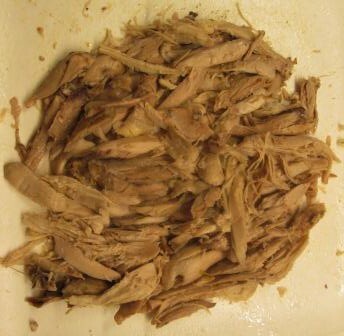 I took the legs out, let them cool somewhat, skinned and boned them, and cut the meat into shreds. Then all there was left to do was return the meat to the soup pot, heat everything through, and sprinkle on the parsley. I had worried more than a little that the soup might be too austere – as pale in flavor as in appearance. Some cockaleekie recipes buttress the broth with additional ingredients: celery, carrots, butter, thyme, bay leaf, chicken bouillon. 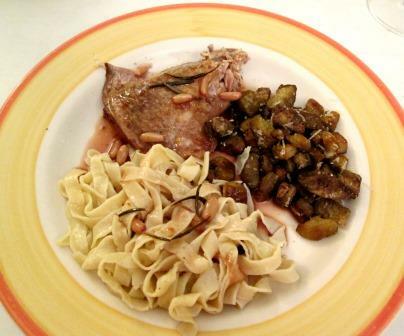 A very traditional variation even includes prunes. But I meant this to be a test of the basic recipe, and to my delight this pure, minimal version passed with flying colors. It was subtly rich, warm and welcoming; the quintessence of chicken and leek. I’m not a food chemist, but I guess I achieved umami. Earlier this week, as soon as predictions began for a “crippling and potentially historic blizzard,” “one of the largest in the history of New York City,” with near-hurricane-force winds and up to three feet of snow, I made my emergency preparations: (1) Rummage in the freezer for hearty, rib-sticking meats. (2) Look up recipes that need the oven going for a long time. The first good prospect my freezer produced was oxtails: a batch of small, tail-tip pieces that I hadn’t used for my last dish of coda alla vaccinara. 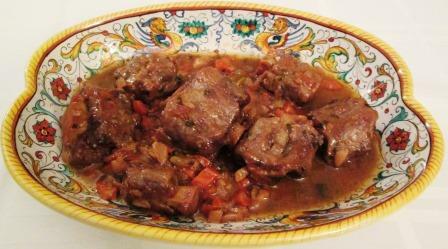 My cookbook research came up with an attractive recipe for oxtail stew in the Cooking of the British Isles volume of the Time-Life Foods of the World series. The day the snow started, I made the dish. It turned out not to be what I would call a stew at all; rather an oven braise. 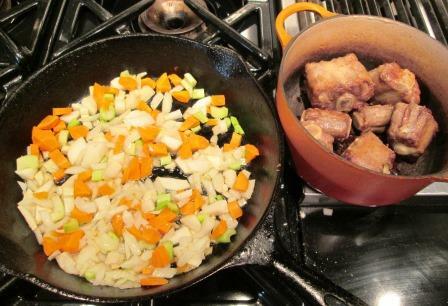 It starts conventionally, with salting, peppering, flouring, and browning the pieces of oxtail in a skillet with lard and transferring them to a Dutch oven. But the good array of vegetables – carrot, onion, celery, and turnip – aren’t added in chunks, as is usually the case. I had to coarsely chop them and cook them all together for 10 minutes in the same skillet that had browned the meat. Once softened and lightly browned, the veg went into the Dutch oven on top of the oxtails, along with a cup of stock, bay leaf, thyme, and parsley. I brought the pot to a simmer on the stove, covered it tightly, and put it in the oven at 325° for 2½ hours. My oven tends to run hot, so I checked it a few times and indeed had to stir in about a cup of water to keep the sauce from thickening too much. But that was all the tending it needed. All right – so I’m never going to be the greatest cook of the 14th century. I got an inkling of that last week, when I experimented with a medieval recipe for pottage. And I’ve now conclusively proved it, since I’ve made a more elaborate medieval dish. I think I’ll stick to reading about gastronomy in the Middle Ages, not trying to practice it. For this second attempt at medieval cooking, I chose a dish called Salmon Pie with Sweetmeats, from Hannele Klemettilä’s The Medieval Kitchen: A Social History with Recipes. Though it covers much the same time period as Peter Brears’ Cooking & Dining in Medieval England, the other new food history I used for last week’s recipe, it’s a very different book. The Brears book is structured around the physical arrangements for preparing, serving, and consuming food. Klemettilä, a Finnish cultural historian, structures hers around types of edibles (chapters on breads, vegetables, meat, seafood, sauces, etc.) and the ways nobles, peasants, and the middle classes ate them on feast days, fast days, and ordinary days. Also, where Brears considers only England, Klemettilä also covers France, Germany, Italy, Spain, and Scandinavia. 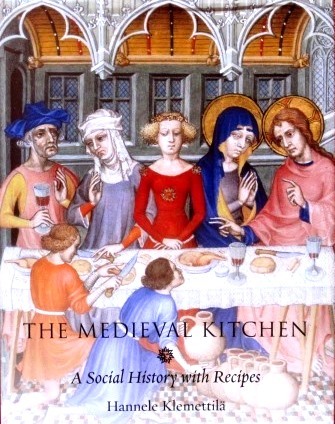 The books provide two interestingly different perspectives on 14th- and 15th-century foodways. The salmon pie I chose to make has all the exuberant array of ingredients that were common among medieval dishes served at the tables of the rich, perhaps on one of the many meatless days. It contains figs, currants, and dates; cinnamon, cloves, nutmeg, ginger, saffron, salt, and pepper; pine nuts and almond milk. Not the kind of things we think of nowadays as accompaniments to fish! I approached the recipe with cautious enthusiasm. The first steps were to make up a short-crust pastry dough and some almond milk. I used a modern recipe for the dough (which the author allows). For the “milk” I boiled ground almonds, water, sugar, and salt; then strained the liquid. Next, I cut dried figs in small pieces, cooked them in white wine until soft, and pureed them. I sliced a nice filet of salmon into strips, cut dates into small pieces, and cooked those two items together in white wine for five minutes. When the fig puree was cool, I added all the spices to it, along with enough of the strained wine broth from the salmon to make a spreadable consistency. Now I was ready to assemble the pie. I lined a pie dish with half the dough, spread the spicy fig puree over it, sprinkled on the pine nuts, and spread the drained salmon-date mixture over that. After adding a top crust I brushed it with the almond milk in which I’d dissolved a little more saffron. That turned the crust a brilliant golden yellow. Baking enriched the golden color and brought up an unusual but savory aroma. I took the pie to the table and cut two plump slices. With some trepidation, we took forkfuls. It was a one-bite lesson in how our culture shapes our lives. It tasted bizarre: an unsettling clash of flavors. 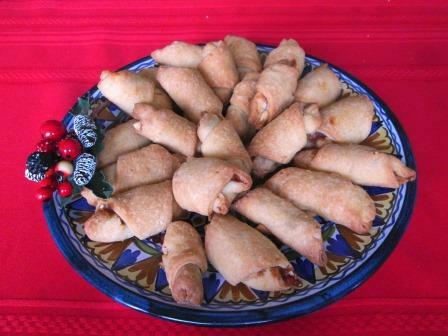 The crust was good – tender and enriched by the almonds and saffron. 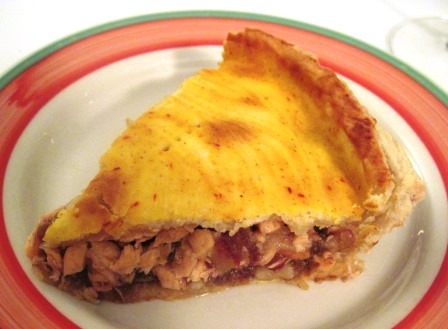 The fig layer was good – spicy, mildly fruit-sweet, and pleasant in combination with the pine nuts and the crust. But the nice, fresh, succulent-looking salmon that went into the pie tasted just wrong! Against the other flavors it seemed positively unwholesome: fishily tart, fishily sweet. Tom’s judgment on the pie was Disgusting! Though he’s always claimed his Jesuit education made him one of the finest minds of the Middle Ages, it apparently didn’t equip him with the commensurate palate. He took about two bites and then just nibbled at the edges of the crust. As the person responsible for this whole undertaking, I doggedly finished my whole slice, trying to accustom myself to the unfamiliar flavors. I couldn’t do it: It remained bizarre, strange and exotic in an unattractive way. I hate to waste food, but the rest of that pie was not eaten. For anyone who might be interested, here’s the book’s reproduction of the original recipe, from Harleian MS 4016. Tart de ffruyte. Take figges, and seth hem in wyne, and grinde hem smale. And take hem uppe into a vessell; And take pouder peper, Canell, Clowes, Maces, pouder ginger, pynes, grete reysouns of couraunce, saffron, and salte, and cast thereto; and ϸen make faire lowe coffyns, and couche ϸis stuff there-in, and plone pynes aboue; and kut dates and fresh salmon in faire peces, or elles fressh eles, and parboyle hem a littell in wyne, and couche thereon; And couche the coffyns faire with ϸe same paaste, and endore the coffyn withoute with saffron & almond mylke; and set hem in ϸe oven and lete bake. Maybe it tasted better in Middle English, served prettily to Chaucer’s high-toned Prioress, while the Miller and the Monk guzzled ale.